Hampers make the perfect gift. 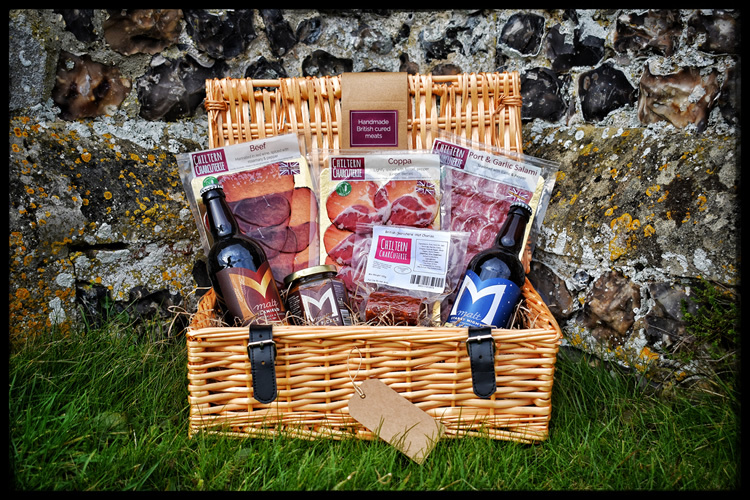 Our Hamper of cured meats and Malt Beer is sure to please. Hamper contains a selection of three meats and one Chorizo. Two 500ml Bottles of Malt craft beer and one jar of Chutney. I ordered the small basket last Christmas for my son in law who lives in Scotland. John was incredibly helpful when I was ordering this gift. The basket arrived on time and both my son in law and my grandson ( then 15 months old) enjoyed the contents. My daughter’s sister in law was very impressed and took details of Chiltern Charcuterie. I have already decided that a basket from Chiltern Charcuterie will be our other son in law’s Christmas present 2018!